When I sit down to read a book, I find a comfortable spot as I usually plan to be there for some time. With ABOVE, I never found that comfort zone because I was putting it down every few chapters. Why? It was such an intense read that I had to walk away but was only able to stay away for a few minutes before I was right back into it. I had to know more. If there’s one thing I didn’t expect from this book, it was the intensity. At 16, Blythe Hallowell is a smart girl, not necessarily boy-obsessed, but there is one boy she can’t wait to see at the Horse Thieves Picnic. When he is called away and doesn’t return, Blythe is hurt. Walking home later, a local man named Dobbs Hordin drives by and tells her that her brother has been hurt. She gets in the car with him, and instead of being the day she met a boy at the picnic, it becomes the day she goes missing from Eudora, Kansas. Dobbs is a local survivalist and has been preparing a missile silo for the end of days. He takes Blythe to the silo, locking her in with his other gathered possessions. When the door is locked, her life all but stops. 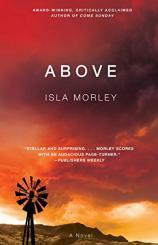 "Isla Morley delivers a book that will drive you through every possible emotion before you get to the end --- and once you get there, your heart will be sore from the beating." During the first few days and months of her captivity, Blythe focuses solely on getting out. She wants to go home to her family, her best friend, and walk in the sun again. Blythe soon comes to the sad realization that isn’t going to happen and is a crushing blow to her mentally. Months pass, and she falls slowly into a dark place fueled by loneliness, anger and despair. After she gives birth to a stillborn daughter, her mental state becomes even more precarious, making even her captor nervous. Seventeen years pass, and Blythe, Dobbs and their son Adam live out their meager lives in that silo. All Blythe can think about is her son and going above. She never gave up hope that one day she would be able to see sunlight in place of the sickly light that governs their waking hours below. Wanting her son to understand the world above, she tells him stories about what it will be like once they leave. Dobbs, who does come and go during those 17 years, never tells Blythe or Adam about the outside world. When an unexpected and unplanned event gives Blythe and Adam the chance to leave, they walk into a world they didn’t expect and weren’t prepared for. I can honestly say I didn’t see the twist coming. I wanted Blythe and Adam to walk out into the sun, and admire the flowers and blue sky. I wanted to see them walk to her parents’ home and be welcomed with open arms. After 17 years of captivity, they walk into a world that neither understands. It’s devastating not only to Blythe and Adam but also to you as the reader. I’m not one for happy endings, but I thought Blythe deserved something after what she’d been through. She wasn’t going to get it. There’s something really wonderful about this twist, though, and by wonderful I don’t mean good. I like that Morley doesn’t let the reader have the happy ending. I like that she takes everything away and leaves Blythe with nothing. In more than one way, Blythe gets to start over with a clean slate, even if she doesn’t see that. While no one forgives Dobbs for anything --- and he certainly doesn’t deserve forgiveness --- Blythe does come to realize a few things about him that she never would have given thought to if she still had been locked behind concrete walls. I won’t lie; this is a book you won’t be able to put down. And if you do put it down, you’ll pick it back up in a few minutes because you won’t be able to stay away. Having devoured it in a day, trust me when I say this. Isla Morley delivers a book that will drive you through every possible emotion before you get to the end --- and once you get there, your heart will be sore from the beating.